Non-fction books tend not to be too impressive when it comes to aesthetics, rich style, original ideas. What they can offer in return, is a true, honest, and often powerful message. 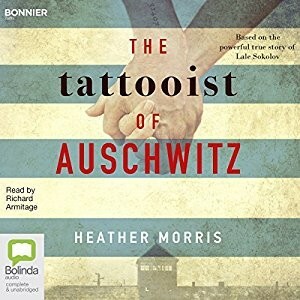 Such is the case of "The Tattooist of Auschwitz". It tells a story of Lale, a young dandy from Slovakia who is sent to a concentration camp. From the very beginning, his narrative is characterized by bewilderment and lack of understanding. New camp reality seems completely incomprehensible and the shock comes through visibly. Further events, as Lale learns how the camp functions, bring even more feelings of utter horror. Hunger, violence, countless deaths, slowly become his everday reality. Despite that, he refuses to give up and fights to make the lives of people around him at least a little better. Soon he becomes the camp's "Tattoowierer" and starts tattooing the number on hands of new prisoners. As such, he was the first official to "welcome" newly arrived prisoners. He tried to soften the initial shock by being polite. There he meets Gita, a woman who will change his life and give him energy to push on and fight for survival. I've read a few similar books and while I am familiar with the historical context, such first person narrative always makes a stronger impression on me. The book is based on interviews with the real Lale Sokolov and ends with some of his original comments. Not an easy novel but definitely worth reading.